Once I finally decided to head down this path of trying e-cigarettes, I initially didn't have a local source for advice so I kind of bounced around trying different things. On this page I outline what I've tried and what I did or didn't like about these options. Hopefully by showing you what is available it will save you time and money. 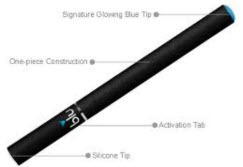 In the beginning I had noticed that a number of displays were going up at various convenience stores, gas stations, and even drug stores about the Blu brand of electronic cigarettes. These are disposable. Use them once and throw them away. Considering they were $10 each, it seemed expensive, but hey they claim it is equal to 1.5 packs of cigarettes. I disagree. Unless you're the kind of smoker that takes 2-3 hits off of a real cigarette and puts it out, this is no where near being equivalent to even one pack of cigarettes. I knew this would quickly become more expensive than smoking the real thing. I then learned that Blu offered some with rechargeable batteries and you could then just replace the tip, also called the flavor cartridge. Their flavor cartridges are disposable. They also have another rather cool option that uses WiFi style signals to alert you of nearby fellow Blu users and or places that sell Blu items. I did feel like the taste of the Blu E-Cigs was pleasant and something I could have easily adopted had they not been so expensive. I then decided to try another brand commonly found at the convenience store call Njoy. These were less expensive than Blu and they also had a pleasant taste, although given a choice I preferred the taste of Blu. By the way, the Njoy packages are so small and mainly taken up with California mandated disclaimers it took me awhile to learn, their Red package is full strength nicotine, like a Marlboro Red, and their Gold package is like a Marlboro Light. The other colors are Menthol. The store clerk had no clue and I ended up buying one of each not knowing any better. Here again, however, these disposables wouldn't last me a day and when I did the math on the money I was spending, I quickly realized these could not be an answer for me. I had to find something else. I did a lot of research online for a better and cheaper alternative to disposable style e-cigs. In the beginning it was important for me to find one that looked and felt like a real cigarette. I knew my addiction wasn't just nicotine but also psychological, and I wanted something in my hand that felt like the real thing. For some odd reason too, I wanted a real looking cigarette as I didn't wish to stand out in the crowd of fellow smokers. I no longer feel that way now. After reading many reviews I decided to order from a company called Green Smoke. I have nothing but praise for this company. Their website is well laid out, their pricing is reasonable, and their flavors are really good. In fact, to this day, their Gold Tobacco flavor is my favorite and I wish I could find it in an e-liquid form. I ordered their Express Kit which you see pictured on the right. These look and feel like a real cigarette, albeit they are noticeably heavier than a real one because of the weight of the battery. The tip is a disposable cartridge (called a cartomizer) that contains the flavor (or e-liquid). Watch the video below for more information. The only negative I would eventually learn about Green Smoke is that their batteries and flavor cartridges use a non-standard size thread. So as I advanced on to a bigger style of eGo battery I find I can only use their flavor cartridges with their batteries. My co-worker also learned it is possible to refill these Green Smoke cartridges with different brands of e-liquid as the atomizer inside of the cartomizer still has a lot of life left in it after the flavor has been exhausted. Below is one of many videos out there on this subject. Here this guy refills it by dropping e-liquid into the cartomizer, but a faster way is to use needle and syringe. As I did more online research I began to be aware of the thousands of flavors available for E-Cigs. I also became aware that some cities around the country (and the world) had Vape Shops. I couldn't find any in Knoxville, TN, so I began to go to local Tobacco Shops to see what they had. I won't mention their name so as to not embarrass them, but suffice it to say, they may know tobacco but they don't know e-cigarettes. I bought a kit from one Tobacco Shop which is an E-Cig kit made by ECG, which I later learned was an eGo style battery that doesn't have a button. Their "tobacco flavor" tasted like maple syrup. Not bad, but very sweet. I made jokes that I was smoking pancakes. In searching for more local sources for flavors and information I was so blessed to find Knoxville Vapor. They currently only have a presence on the weekends at the Great Smokies Flea Market. The owners, Bill and Terri Livezey are super friendly and down-to-earth people that have been vaping for years, but only recently started this business. They have plans to open a retail store in Knoxville and I wish them nothing but success. Bill and Terri were so patient to answer my questions and let me try (and re-try) their many e-juice flavors. I initially bought a kit from them as you see pictured on the right. For the next 4 weekends in a row I went back to the flea market, sometimes bringing friends with me. Each time I would buy more stuff. Sometimes more flavors and another kit for myself and sometimes items as gifts for others. On each visit I, as I observed Bill and Terri working with other uninitiated customers, I was always struck by how patient they are. I appreciate too that they steered me to the low-cost kit to get started. Since then I have learned the eGo battery in this kit is a world-wide standard and the connectors on this battery fit various styles of atomizers, cartomizers, and tank systems made by various manufacturers. And for tank systems, there are a wide variety and styles of those as well. I highly recommend this type of starter kit for anyone considering e-cigarettes. I don't make any money on this, but I want to help return the favor for their help in getting me started. My co-worker, Mike Reed, started using E-Cigs shortly after I did. I'm so fortunate he did. With his natural inquisitive nature, he began exploring all of the options and educating me about various eGo style connectors and adapters and tank options. For both of us this has become a hobby. He calls it a passion, but his wife calls it an obsession. As we each learn something new, we share it with the other. One day he ordered some cartomizers from My Vapor Store and gave me one to have. These fit perfectly on my eGo batteries that I purchased from Knoxville Vapor. I mistakenly filled it with a flavor that I didn't care much for. As I went to vape it, I was stunned. I liked it. Hey Mikey! I ended up ordering more of these Kanger 510 cartomizers, mainly so I could more quickly try out new flavors. I also ordered more of that flavor I initially didn't care for. What I have since discovered is that there are some flavors of e-juice that actually seem to taste better depending upon how hot the atomizer (or coil) gets. Mike and I measured them and they are about 2.6 Ohms. Some of my e-liquid tanks measured at 2.3 Ohms. So this slight resistance difference equates to different current levels (Milli-amps), thus different temperatures. I have also since learned why variable voltage batteries are so popular. By varying the voltage for a given resistance of the atomizer coil inside of a cartomizer or tank, you are varying the temperature that the e-liquid is getting vaporized and thus the flavor (or taste) changes. So for each given e-juice flavor you might want to experiment to find that sweet spot for that given flavor. These particular Kanger Cartomizers are what are referred to as "single coil". Some tanks and cartomizers are "dual coil". They literally have two coils inside instead of one. That too will affect the temperature, thus the taste at a given voltage level. Speaking of these Kanger Cartomizers, it is also worth noting that they come in either stainless steel or black. The black ones are not painted, but rather black paper wrapped around the barrel. Even on some of my new ones, the black paper was peeling. In fact I went ahead and peeled it all off of one of them and found it is just the stainless steel style underneath. Unless you just really want black, I recommend just buying the stainless steel style. I've also purchased several styles of Drip Tips from My Vapor Store. Both you see pictured to the right fit nicely on the Kanger 510 Cartomizer's I mentioned above. I needed a drip tip with these cartos because the hard round metal of the cartomizer was uncomfortable on my lips. The soft ones are nice if you tend to bite or chew on the ends of things you place in your mouth. Both are nice, but I prefer the more traditional hard plastic style. Note: Click on the pictures to the right to go directly to them on My Vapor Store. I'm hooked. I soon plan to purchase a variable voltage battery. My friend and co-worker, Mike Reed, just purchased a Vamo, which is a variable voltage and/or a variable wattage style of battery. I'm eager to see that.